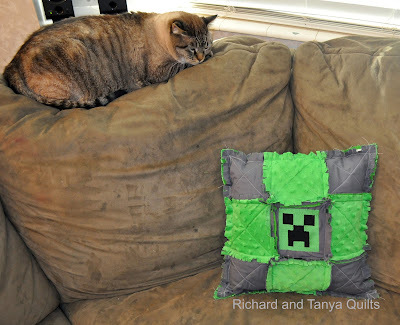 In our home I can not tell if it is the toys (creepers in this case) or the Cat's keep the attention of the kids more then the other. 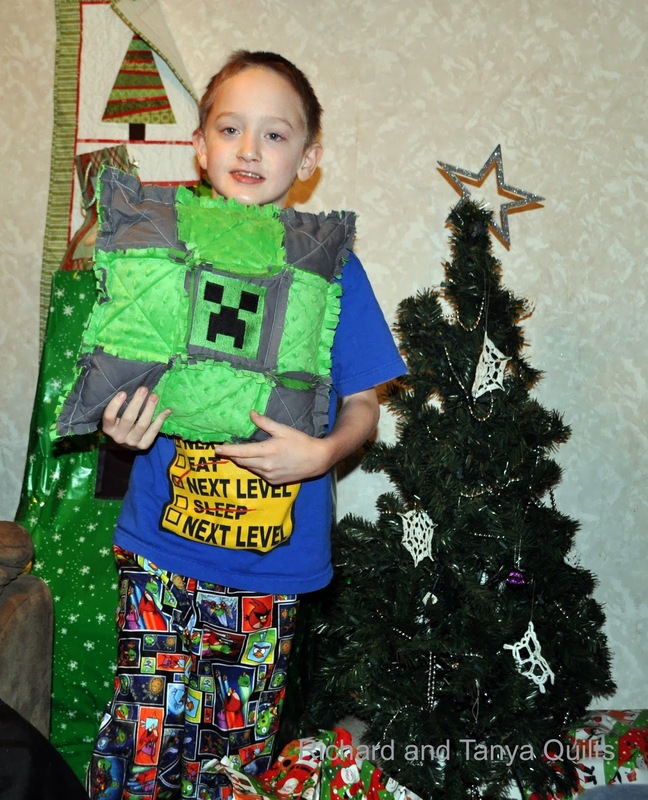 Jared who received this pillow for Christmas is a fan of Creeper's for those that dont know what a Creeper is it is a monster from a game called Mine Craft it is one my son likes a lot. He even Dressed up as one for Halloween and mom made him a costume of it. Here he is just after he opened his present Christmas Morning. Here is a closeup of it on the couch. 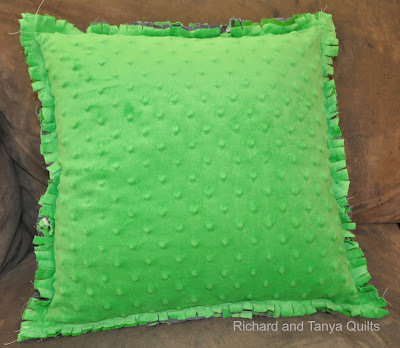 This pillow was not washed yet (mom was afraid he would see it before Christmas) it will get a washing soon enough as Jared seems to get things dirty fast like most boys do. Tanya for Christmas made many of the neices and nephews pillows for Christmas as the weeks go on I will try to make sure each of them get a posting. 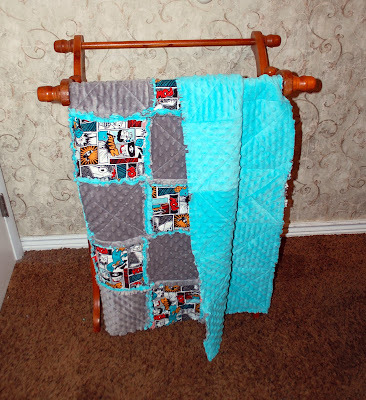 Tanya found some cute Perry material while visiting the LQS and she just had to make her self a Perry Rag Quilt. Me I am not so much a fan of Perry but my kids do love it and it looks like Tanya is kind of Pro Perry also. I really do enjoy the gray and turquoise though as they blend together well. 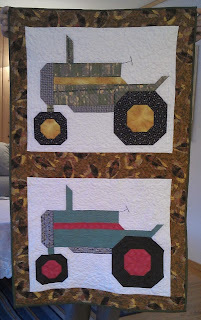 Over the last month or so I have been working on this large Twin Size quilt for my son James. 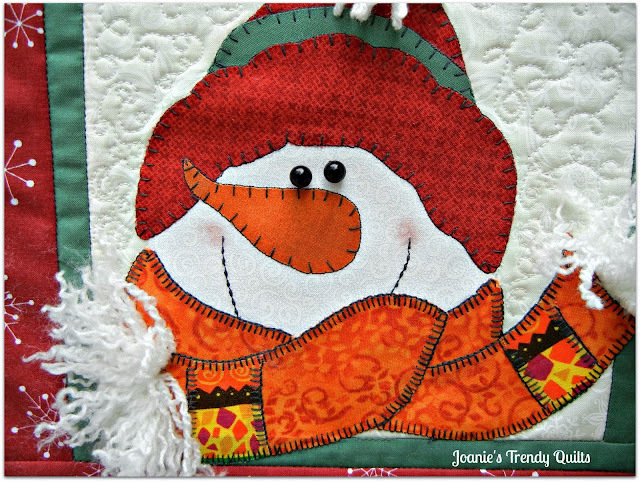 It is from a pattern called Winter Windows Quit in the book Quilting Modern by Jacquie Gering and Katie Pedersen. I love this book and am inspired by the neat modern designs in it. 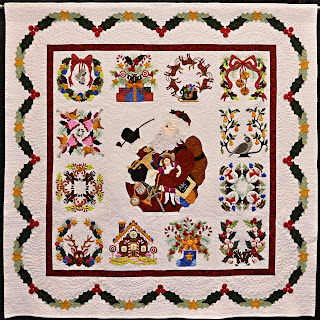 I have been going to the Modern Quilt Guild for over a year and half now and this is the most modern attempt to date to be a modern quilter. As you can tell this quilt is not finished yet. 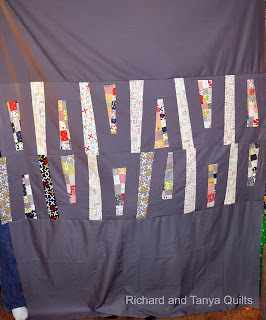 I have now completed quilting about 2/3 of it so it wont be long tell its done. After all it was my son's Christmas present so yes I need to finish it sooner than later. 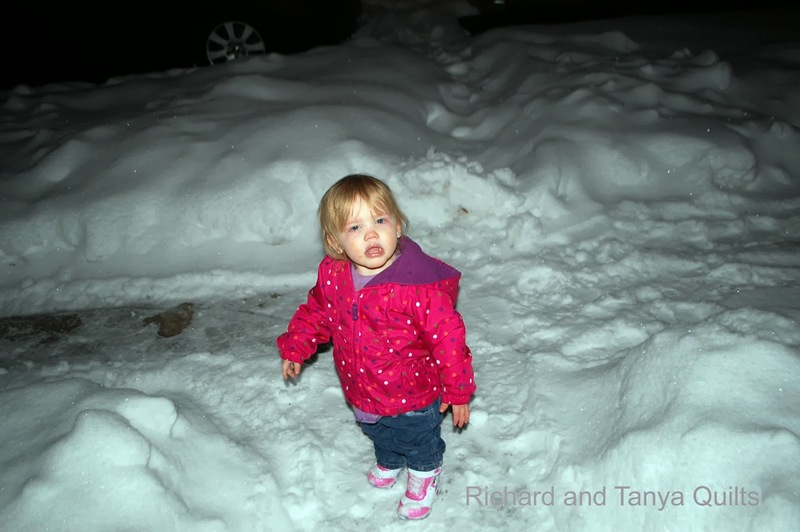 And of course who cant resist seeing a cute kid in her brand new snow boots. These are some of the fantastic things finished last week. Please link up what you have been working on. 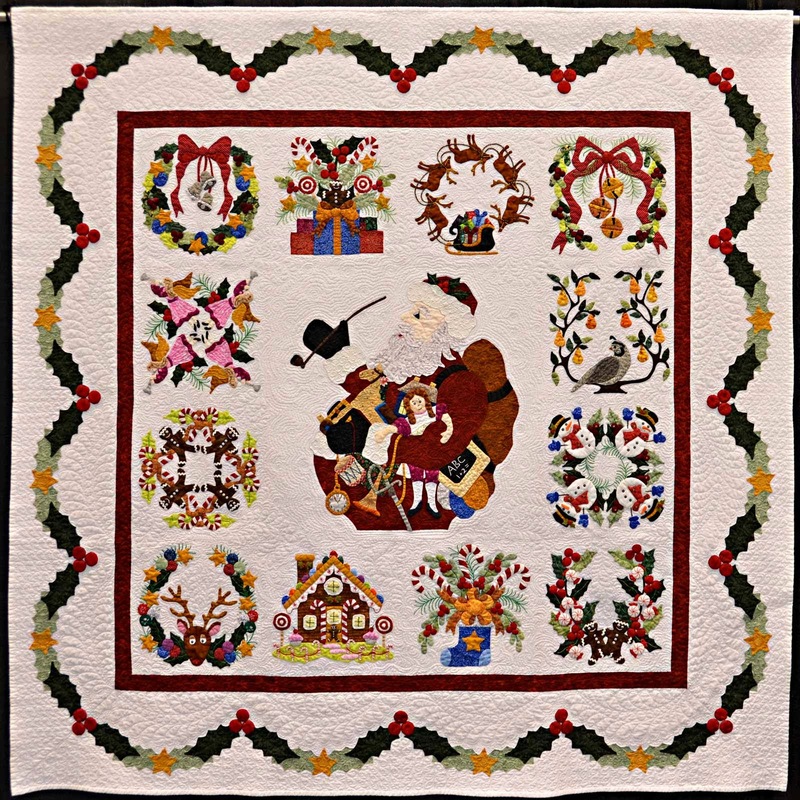 I am rarely off topic of the blog (quilting) but since it is Christmas Time I will take the liberty of sharing something of me and my family. We have a couple Traditions that we do as a family. The first and the funnest is that for the 12 days proceeding Christmas (up to the 24th) We pick 3 family's in our local area and do the 12 days for them. For us that means giving a secret gift delivered each night to the 3 family's This year we ended our 12 days giving away Table Runners that I will show off another day. 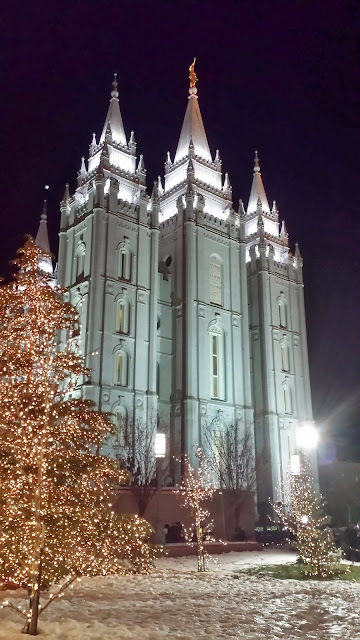 The other holiday tradition that we do is visit Temple Square here in Salt Lake City, UT I and my family are members of The Church of Jesus Christ of Later Day Saints. Often referred too as the Mormon's. 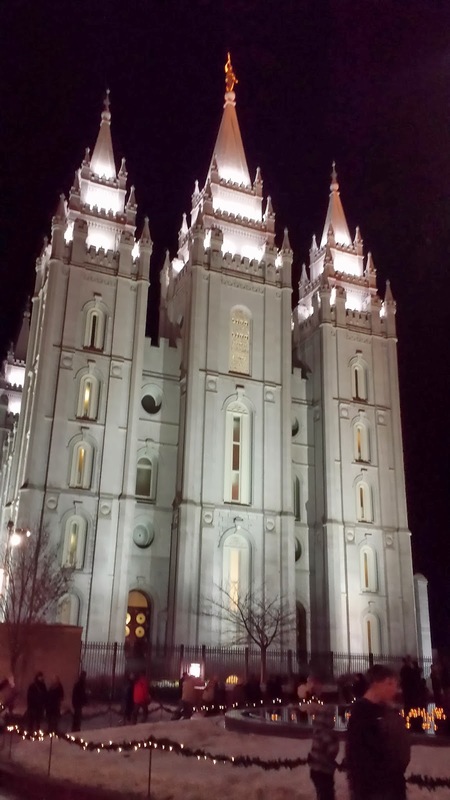 The pictures below is of the Salt Lake Temple which is only a few blocks from my house at the center of Salt Lake City. 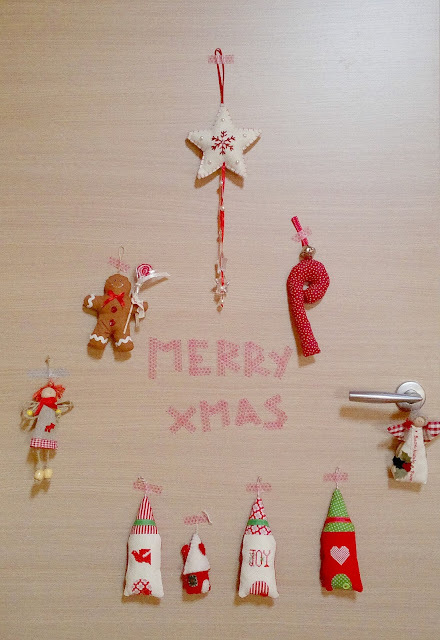 I hope that all of you had a wonderful Christmas and have a happy new year. I know you are saying, "Its Christmas Eve not Valentines?" But hey you know me I am a little different (ok maybe a lot different) But it is not Christmas Eve its Valentines or at least it is for my Beautiful wife because yes it is finally finished. 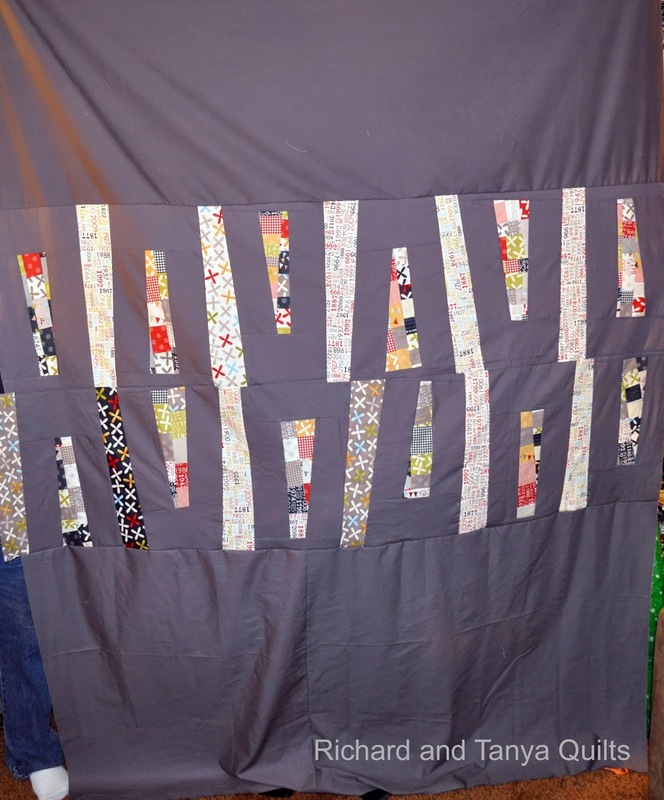 My wife has been giving me some serious flack for not finishing things and or quilting at all. 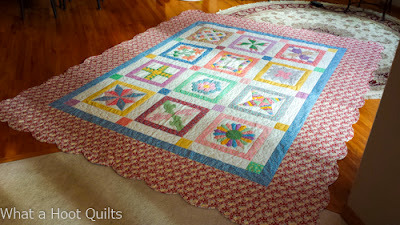 So while working on my son's quilt for Christmas I finished finally quilting her valentines day present for last year. So Valentines day is in February its now December, see I am hardly behind. 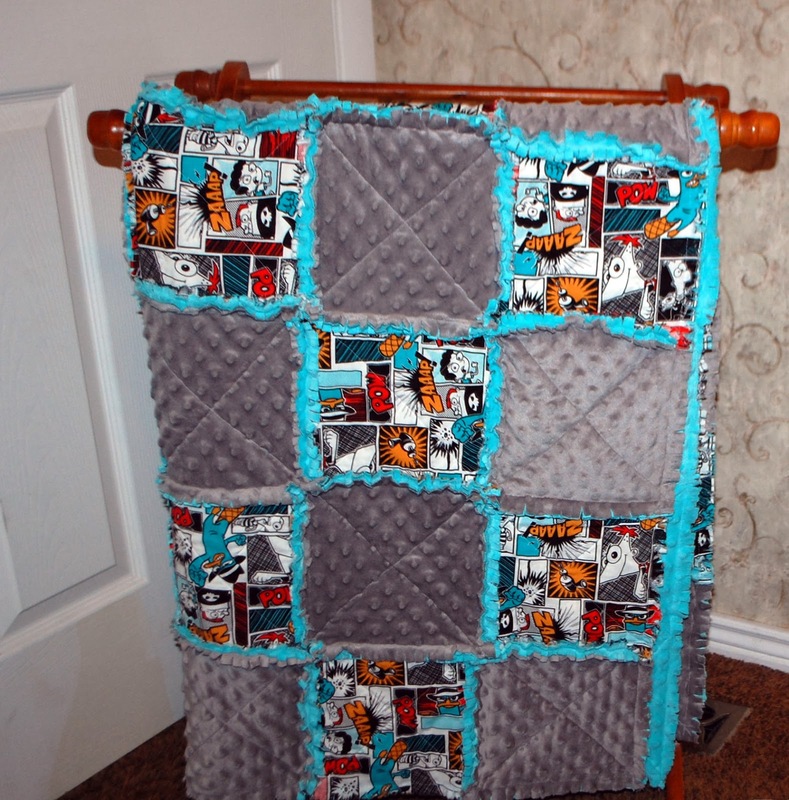 I had fun quilting this though its hard to see what I did. I echo quilted out the heart both inside and out. Then I square quilted the rest of the quilt (well echo quilted the squares with exception of those that I echoed around). Here is a close up of the left over junk I tossed onto the back. 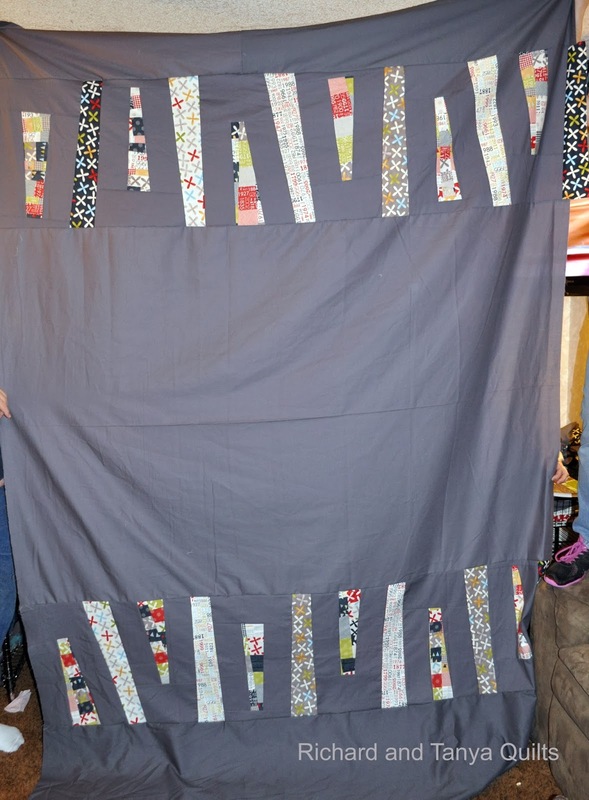 As a want to be modern quilter the back is as important to make a statement as the front. 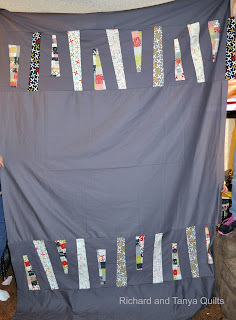 Here is a close up of the top front so you can see what I was talking about on quilting. Now what holiday should I do next? I am still not ready for Christmas. 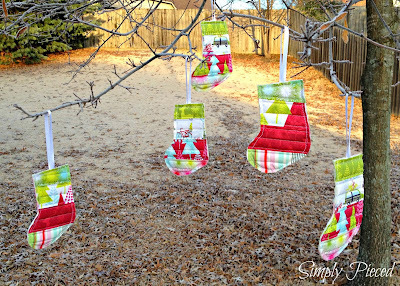 This week is Christmas and I would like to encourage you to link up your normal stuff and then also go find your favorite Christmas item you have made and make sure you link that up too. Tanya loved to point out that some of these were posted previously. I took these holiday items from the last 3 LAFF. I like just sitting inside and watching it come down. Thanks for the giveaway! She has been emailed, if we don't hear back in 48 hours we will pick another winner. Thanks to all who entered. Lots of great link up's last Friday. Last week included a giveaway if you have not entered you should go check it out. We are giving away two yard of fabric. One of Kona Bone and one of City Girl Holiday by Kitty Yoshida. This giveaway will end on 12/13/13 at 5 pm PST. To enter leave a comment telling us what is your favorite thing to do on a snow day? 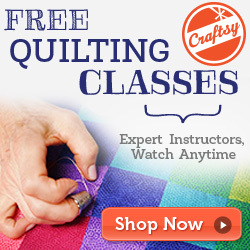 To earn a second entry visit My Craftsy Patterns and tell me which is your favorite. If you would like a copy of that pattern emailed to me please let me know and a copy of it will be sent free of charge. These are 2 of the great quilts linked up a couple weeks back. 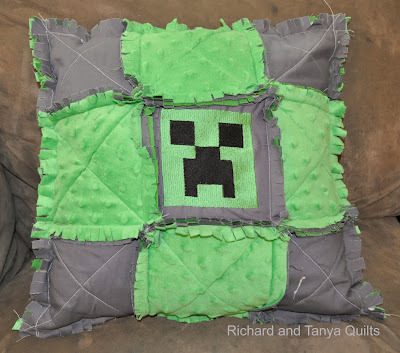 Life has been crazy at the home of Richard and Tanya quilts and the last few months have not been as productive as desired. And even worse what quilting I have done I have not taken pictures of and blogged I will try to get better at this soon. In the mean time please share what you have been up too while getting ready for the holiday season. Over the long Thanksgiving weekend Richard made a comment that I hadn't made a rag quilt for quite some time, so I made three. The first had two fabrics, but seemed somewhat boring, so I had to add something to it. 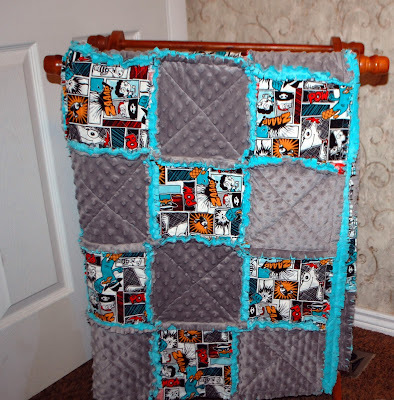 I hit a Black Friday sale for a few pieces of flannel to complete some rag quilts. I was very reserved and only came out with 2 yards of a few prints and 6-8 yards of a couple of solids. Much better than my 12+ bolts last year. Here is the first. 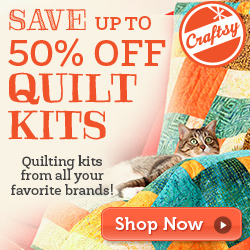 I had the dots and pink already but not quite enough to make a quilt. I added the butterfly print to the mix. 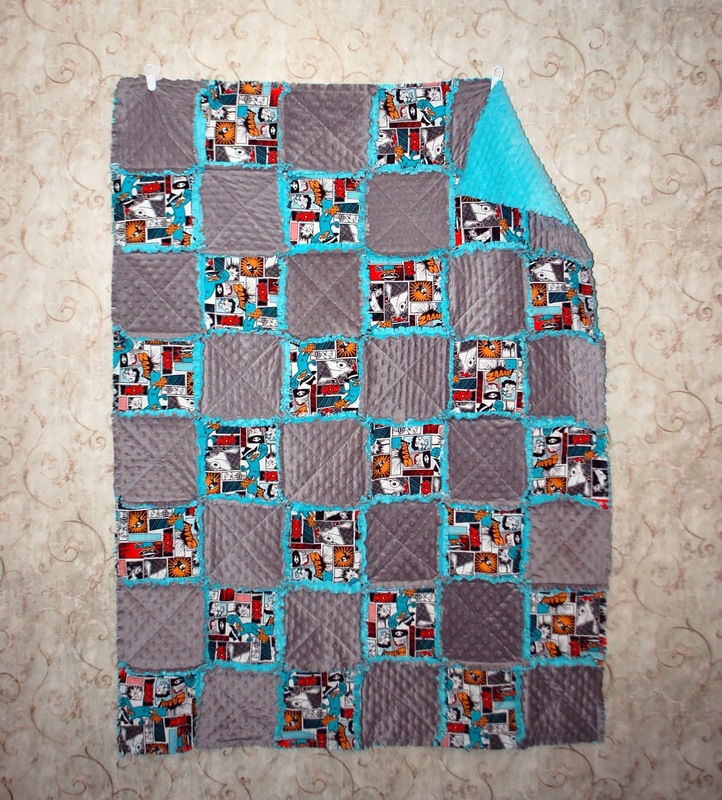 The quilt has been added to Etsy store. Richard is busy working on a quilt for our oldest James. 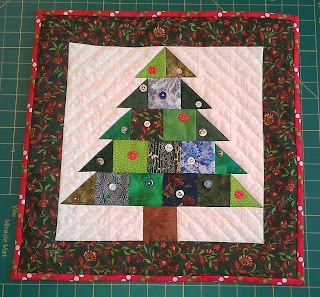 It is a twin size, hopefully it will be done for Christmas.